Nilufer Demir, a Turkish press photographer, was snapping a group of Pakistani migrants by the coast when she noticed the lifeless body of Alan Kurdi at the water's edge. Ms Demir reacted as any photographer would - she clicked her shutter. The starkest image she took - which the BBC has decided not to publish - shows the three-year-old Syrian boy lying dead and alone, face down in the sand, his small palms open and upturned. "I had to take this photo and I didn't hesitate to," she told her agency DHA. "The only thing I could do was to make his outcry heard." She could not have predicted how loudly that cry would be heard across Europe and beyond. "I never believed a photograph could have such an impact," she said. "I would really like it if it could change the way things are going." There can be little doubt now that the picture has in some way changed, rather than just documented, the refugee crisis unfolding into Europe. But what does it take for a single image to cut through where so many others failed? And why that particular image? Will Wintercross is an award-winning war photographer for the Daily Telegraph who has worked in Syria and recently founded a charity for the country's refugees. He says he has taken many similar photographs. "Pictures like this are taken all the time, but not necessarily filed all the time because they are so graphic," he says. "Most will hardly ever be seen by anyone." "In Syria you see so much that's gory that you start to filter out what's not worth photographing ... You just know some pictures will never be used." The very fact that Ms Demir's picture was not taken in Syria was a key part of the reaction, he says. "This picture wasn't taken in a warzone, it wasn't taken in Syria ... The fact that this happened on a beach in Turkey has made people sit up and look." Then there was the composition of the image, terrible but not gory as many of the worst war photographs inevitably are. "The picture is shocking but half of what happens when you see it is subconscious - you are filling in the blanks," he says. "It is a quite peaceful picture and in some ways quite respectful, but it makes you think immediately: what could have precipitated this? Why is a toddler dead on a beach? Those thoughts are perhaps most visceral for parents. David Cameron echoed many reactions on Twitter when he said that, "as a father" he had been deeply moved. Nicole Itano oversees all creative work for Save the Children, including photography. She is also the mother of a one-year-old girl. "My first reaction was, my god, that could be my child, who has the same colour hair, the same chubby legs," she says. "I've thought a lot about why that image really resonated. For years now, we've been seeing incredibly graphic images coming out of Syria and they haven't galvanised public response in the way this has. "Part of what touched people about this picture is that it is shocking but it isn't graphic. He isn't maimed, he isn't bloodied, he looks like he could be sleeping except for the context. "He looks like he could be any of our children." Ms Itano says Save the Children does not have a hard and fast rule against using images of dead children. "Every case is different and has to be evaluated on a case by case basis," she says. In this case they didn't publish the image but they did link to an article in the Independent that did. Many news organisations, including the BBC, decided against using the most graphic image of Alan's body. The Independent stood apart in publishing it in full, on its front page. "It was not an easy decision," says the paper's deputy managing editor, Will Gore. "But our view was that this image was clearly something of a different order to images we'd seen before, and came at a time when the debate about what to do seemed to be getting nowhere. 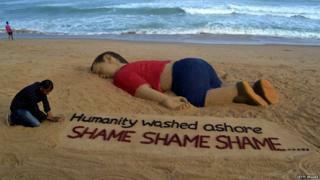 "We felt very strongly that we needed to publish this image of this tragic child. The decision to use that particular image came down to the telling nature of it. The image a lot of people used of the boy being carried away is extraordinarily powerful, but we felt if we were going to show the real horror of what happened to him, that was the best image." It is rare to see a picture of a dead body in a newspaper. Most organisations, including Save the Children, have a loose rule that images of corpses are not printed. That is for good reason, says Mr Gore; "It's right that we should use images of death rarely, otherwise they will lose their power." And Mr Wintercross agrees: "There is a balance to be struck," he says. "I do think we play it too safe but it is difficult because what you absolutely can't do is bombard people. If there are five dead kids on a beach next week, where do you stop? How extreme do you go?" Besides, there is no picture "that could go beyond this now", he says. "People have seen a lot of other images from this war, but that image felt like the coming together of all of those other pictures and newsreels. It seems like everything culminated in that one picture."